Eel may not be the first thing you think of when you think of paring something with a mint sauce. We assure you that this is something to share and enjoy! • Coarsely chop garlic. Scatter mint and parsley over garlic, and continue to chop until mixture is minced together. Transfer mixture to a small bowl; stir in lemon juice and vinegar. Stir in oil to form a slightly thick paste; set aside. • Heat a large skillet over high heat; generously scatter salt in bottom. Add fish to skillet. Cook, turning once, until eel is just cooked through, 2 to 3 minutes per side. 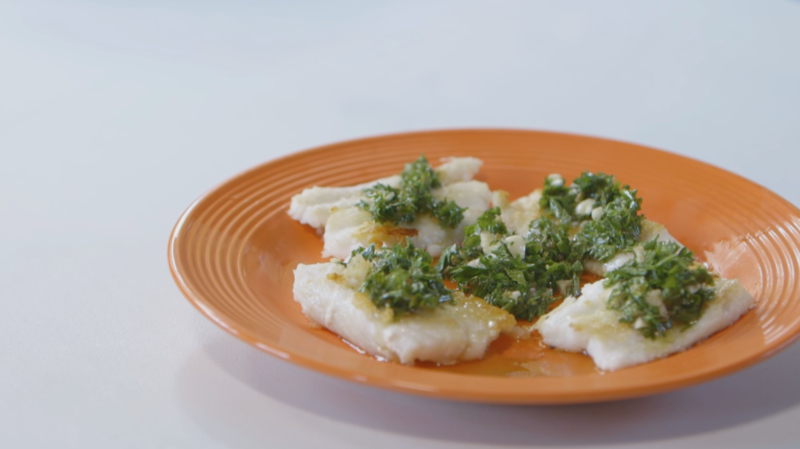 • Transfer the fish to a serving platter; spoon mint sauce on top. Serve with more sauce on the side.